Study faster + study better by making these tweaks to your phone. There is no doubt that Americans are tethered to a smartphone, so let’s talk about tips to stop wasting time on your phone and actually make it work for college. Online students are using phones for studying, but what about all of the other apps battling for your attention? By making a few tweaks you can use your phone to help you to focus on what is most important, maximize your time, and get more done. I love technology and have been carrying a smartphone for the past 10 years. At some point, I noticed that I had an addiction to it. It’s like I had lost the ability to be still for 10 seconds and had to flip on the screen to see what I was missing. Entertain me, phone, because I can’t stand in line for 3 minutes by myself! Have you ever noticed that feeling? Around this time I was working on my online master’s degree while also working full time and it dawned on me that if I couldn’t break my phone habit and start making it work for my own productivity, I was never going to finish my degree program. It was hard to break at first, but I worked on the strategies below and will never go back to my old way of letting my phone run my life. If you are an online student, there are key skills to be successful as an online student, and managing distractions is extremely important. 1. Install your calendar and to-do list apps. This ensures that you always know what assignments are due and what your next steps are when you sit down to study. When you have a solid plan in place and you can easily see what to work on, you never get stuck in confusion. You just keep doing the next thing and see amazing results. 2. Install the Quizlet app. This free web service allows you to create your own set of flashcards and easily work through them in several different modes. This is a fantastic way to work on memorization. Make this even better by creating your notes in question/answer format. You can easily convert these type of notes into a Quizlet that makes studying your notes a breeze. This is a 100% must when you are studying, but you may be surprised how much less stress and time are used up by useless notifications that pull your attention away during the day. I only receive notifications for calls and texts on my phone and I have to check all of the other apps manually when I want to see what is going on. When I decided to make this change, I was really nervous about what I might miss out on (fear of missing out, anyone?). But, you guys, this blew my mind by freeing up an amazing amount of mental energy for me! I don’t miss those notifications and I have reached so many more goals because of it. 4. Don’t Answer the Phone! Remember that your phone has voicemail. People can even text and let you know what they need. Your friends/family can leave a message and wait half an hour for you to call them back after your study session ends. It may seem innocent, but having your concentration broken by phone calls can lead to a very unproductive study session. If you have trouble not answering the phone, try silencing your device. Try some noise canceling earplugs and then you won’t even hear the buzzing in your bag. This takes away the temptation to answer every notification. 6. Turn on Do Not Disturb Mode. You have to try this out during your next study session. Flip your phone to Do Not Disturb Mode so that you aren’t receiving any notifications. You will see your productivity soar when you aren’t constantly pulled away by the phone. I started doing this when I go to sleep and my nights are so much more restful now without the pings and dings of the digital world. Seriously. Just walk away. If you have trouble breaking the habit of reacting to every beep, put the phone down. You don’t have to make your phone productive for college, you can just choose to disengage completely when it is time to study. If that’s still hard, ask a toddler to hide it from you! They’ll have fun and you won’t have to stress about what you may be missing. When you manage your attention you can create free time, and it feels so good! 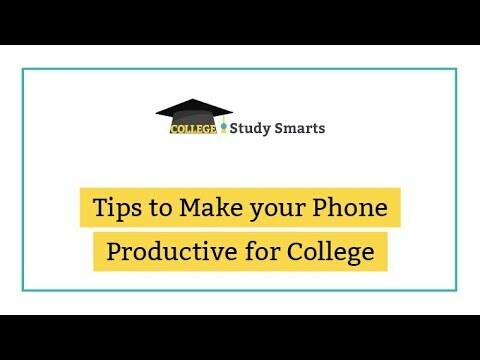 What other tips do you use to stop wasting time and make your phone super productive for college? Choose 1 strategy from above and put it into practice during your session today. Did it feel amazing? Pick another strategy and try it out. Leave a comment below and let me know your tips to stop wasting time on your phone.